A Fleetwood school is preparing for a county wide dancing competition having scooped first place in the local heats. The children from St Wulstan’s and St Edmund’s Catholic Primary School are looking forward to the Lancashire Schools Dancing Competition, which will be held in May at the Guild Hall in Preston, where they will showcase their moves against school troupes from across the county. 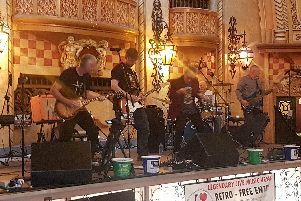 The dancers wowed the audience with their routine to Bohemian Rhapsody at the Wyre and Fylde heats, completely owning the dance floor inside the stunning Blackpool Tower Ballroom. It has been an exciting few weeks for the school. As well as the dancing success, they also swept the board at the Wyre Schools’ Swimming Gala. The swimming team reached every final at the gala, winning one gold in the individual races with several other swimmers being placed second and third. They also won two relays races to take the overall title. Headteacher Jane Barnes said: “I am so proud of both groups of children. The school also took part in a separate event on Monday where they took part in the Celebration of Music event at the Winter Gardens alongside primary schools and high schools in Wyre.